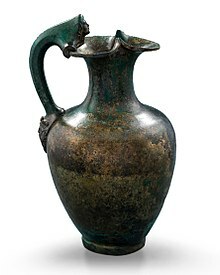 An oenochoe, also spelled oinochoe (Ancient Greek: οἰνοχόη; from Ancient Greek: οἶνος oînos, "wine" and Ancient Greek: χέω khéō, "I pour"; plural oenochoai or oinochoai), is a wine jug and a key form of ancient Greek pottery. There are many different forms of oenochoe; Sir John Beazley distinguished ten types. The earliest is the olpe (ὀλπή, olpḗ), with no distinct shoulder and usually a handle rising above the lip. The "type 8 oenochoe" is what one would call a mug, with no single pouring point and a slightly curved profile. The chous (χοῦς; pl. choes) was a squat rounded form, with trefoil mouth. Small examples with scenes of children, as in the example illustrated, were placed in the graves of children. Oenochoai may be decorated or undecorated. Oenochoai typically have only one handle at the back and may include a trefoil mouth and pouring spout. Their size also varies considerably; most, at up to 25 cm tall, could be comfortably held and poured with one hand, but there are much larger examples. 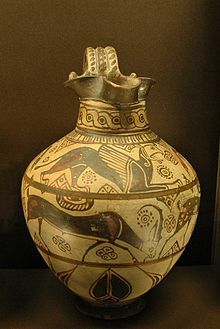 Most Greek oenochoe were in painted terracotta pottery but metal oenochoai were probably also common among the better off, though as with other vessel shapes, few have survived. Again as with other shapes, large versions in stone were sometimes used as grave markers, often carved with reliefs. In pottery, some oinochoai are "plastic", with the body formed as sculpture, usually one or more human heads. Chous, last decade of the 5th century BC, 9.1 × 7 cm (3.6 × 2.8 in). Probably used in a child's grave. ^ Beazley Archive, Oxford University, "Oinochoe, olpe and chous"